Very rare that Serie A has games on a Friday, and rarer in recent history is Juventus facing such a huge match in their quest for 7 straight league titles. But sitting in third place 4 points behind Napoli, a loss Friday at 2:45pm EST would mean they would be 7 points off the pace; unfamiliar territory for the Old Lady. And perhaps unfamiliar for the hosts who are the frontrunners for the first time in a long. Usually they would be chasing Juventus, a giant that they would not be expected to catch. A certain inevitability of Juventus running away with the Scudetto has made Italian league football anticlimactic over the last half decade. But today, On December 1st 2017, Juventus are not their dominant selves. Gonzalo Higuain is just coming back from injury and will be treated with hostility back at his old club. Mario Mandzukic is injured. Juve's defence has not looked like their superb best conceding goals at a higher rate than in previous seasons, and Napoli who score a lot of goals, and concede few at home look ready to take this scalp. This is Napoli's biggest game in a long time and I see them delivering. 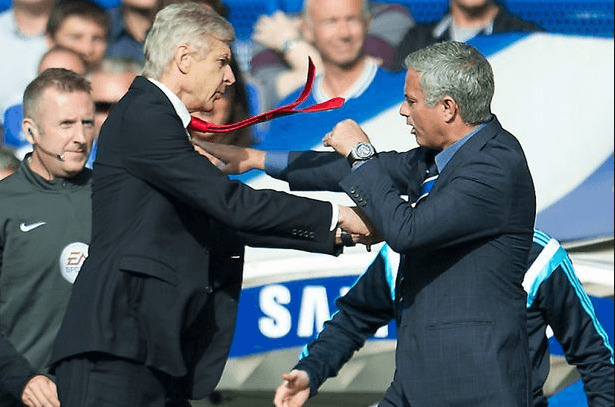 Up until 2 seasons ago, Arsene Wenger had never beaten Jose Mourinho...ever. Then in the community shield right before the start of Mou's disastrous end at Chelsea, Wenger finally got him. But who cares, the community shield is just an exhibition. Then last season in Arsenal's trip to Old Trafford, United was about to close out an archetypal Mourinho win when out of nowhere an Olivier Giroud last minute header equalized the game and left everyone stunned. At the rematch at the Emirates an archetypal Mourinho lockdown game was ruined by two quick Arsenal 2nd half goals and now Wenger finally got a league win over the Special One. After the game Mourinho gloated as if he was supposed to lose eventually to Wenger and as if this was all part of the divine order. And when Manchester United go to the Emirates this Saturday December 2nd at 12:30pm EST United will be facing the hottest team in England, not named Manchester City. And since Manchester City aren't dropping any points, every United game is basically deciding how early we crown the Citizens Champions. United are the only hope at the moment for a title race. Mourinho is really good at winning titles, mainly because he is bankable when it comes to his away results against other big teams. The score stays low, and he almost never loses. If World Football was a craps table, Jose Mourinho would be the don't pass line. City have scored 15 goals and conceded 1 in their last 4 games vs West Ham. West Ham just gave up 4 goals to Everton midweek and their fans have allegedly been singing songs about getting relegated now that David Moyes is the man hired to keep them up. Think of a great boxer like Floyd Mayweather facing another boxer who isn't as fast, has very little ring generalship, and poor defensive skills. That's the best metaphor I can think of for what Sunday will look like. But in the boxing ring, once the ref gets tired of watching one guy get hit without reply, he can stop the fight. West Ham have to deal with the whole onslaught for 90 minutes. Don't be shocked if a few of the 11 players in this mentally fragile team check out early.